Where can you look for volunteers? Volunteers and volunteering in sport: Some ideas, advice and agencies that can help you. An extract of my presentation to a recent British Orienteering Conference. said, George Bernard Shaw, and I agree. Ever wanted to put your hand up but hesitated in the face of negativity? Ever watched while a single doom-monger, with a well-timed outburst, puts off a whole crowd who are working on a good idea? You may have just encountered a pessimist. Pessimists will often sound like this: He tried whatever you are suggesting once (just once, mind!) and it didn’t work. She did something similar to what you are suggesting and it didn’t work. They know someone who tried something …….. Separate yourself from these negative people. You will never change them. They may be people who have always had trouble seeing the positive or they have had a past experience that has put them off. Dismiss their discouraging remarks for what they are – usually an isolated or historical example not relevant to the plans in progress. Gather strength in numbers if there are more of you with positive ideas on what CAN be done, stick together. Support each other. What ever happens, don’t let a lone negative voice disrupt the way of progress and good ideas. If all else fails, quote George Bernard Shaw at them! Want to join in and help with a local sport event? Saturday 27th July 2013 is the anniversary of the London Olympic Games opening ceremony. If you were inspired by the Olympic Volunteers a year ago, do you want to dip your toe in the water of volunteering now? No big commitment. No long journey. If you do, Join In UK has the answer by offering you a way to find a sports even near you that needs some helpers. There are more 10,000 events to choose from all between July 27th to Sept 9th. I was lucky enough to be at the Olympic Park for the launch and I recommend you watch this video now for some inspiration! And you can listen to Dave Moorcroft (Director of Join In Local) talking to Danny Norman of parkrun. If you want to be part of the Olympic Games volunteering legacy, then Join In is the place to start. And if you are a club or group looking for volunteers you can register here. ….. have I mentioned I was on TV? I recently had the opportunity to take part in a UK Parliament House of Commons Education Committee enquiry into school sport. Anyone who knows me will be aware that I am passionate about sport for young people and I welcomed the opportunity to give evidence to this committee. I was free to speak my mind and had no employer or political masters preventing me from saying it as I see it! You can see the written report below, and view the BBC Parliament footage (which was broadcast live). Jonathan Edwards, Olympian and triple-jump World Record holder, speaks very eloquently later in the enquiry and says that he too can say what he likes whereas some of the panel have been “minding their Ps and Qs”. He thinks it was a very bad decision to dismantle School Sport Partnerships. He also raises the very relevant point about needing a way to measure PE outcomes. We live in an age when schools are judged by league tables and these are based on results of public exams. As there is no current way of measuring the effectiveness of teaching PE and sport, physical education is not included in the league tables. And if PE and sport are not included then these are never going to be priorities for schools to devote time and resources. “As a society we have to decide how much we value sport and physical education”. School Sport following London 2012: No more political football – the published report. BBC Parliament TV coverage – it is all a very interesting debate, but if you just want to see me on TV then you might prefer to fast forward to 50″. Jonathan Edwards speaks from about 1′.40″. Volunteers’ Week – anyone for sport? If Volunteers’ Week makes you want to start – then let me inspire you with some leads into sport volunteering. You don’t need to be sporty – some of the best volunteers I know wouldn’t dream of breaking into a sweat! Sport Makers is the official London 2012 Olympic and Paralympic sports legacy, a Sport England scheme for sport volunteering. Watch this video to find out what it is all about. Formal or informal, your own initiative or part of a club – support and training is there for 40,000 Sport Makers. Sport volunteering doesn’t need to be all form-filling and formalities. There are weekly parkruns all over the UK, and becoming worldwide, that are organised entirely by volunteers. You can find your local parkrun and contact them by e-mail – the address is on each parkrun’s volunteer page. Or just pitch up to the start of your local parkrun – at about 8.30 on a Saturday morning – and offer to help and they will involve you in the team. It will take less than 2 hours and you can probably join them for coffee afterwards. Cancer Research UK organises Race for Life runs all over the UK. There is bound to be one near you. They urgently need volunteers to help on the day – find out more and sign up here. No previous experience required – a great place to start. This is a National day when companies support their employees to get out and volunteer in the com munity. It is organised by Business in the Community. “It’s set to be a record breaking year here in the UK – we’re currently sitting at 12,000 business volunteers, 300 companies, approximately 96,000 volunteer hours and £1.5 million worth of support for UK communities.” said Tom Gater of Give & Gain. Give & Gain Day encourages thousands of people across the globe to spend a working day volunteering for good causes in their local community. Since 2008, over 60,000 people in 31 countries around the world have taken part. Give & Gain Day connects skilled professionals with community organisations by matching them with a volunteering project, offering invaluable support in tough times. Business volunteers will help in schools, day centres, and youth groups, doing everything from school sports days, to employability workshops and CV training for the long term unemployed. The 2013 event takes place against the backdrop of increasing pressures on local services, with recent figures suggesting that 1 in every 6 charities are at risk of closing. With the level of unemployment among 18-24 year olds sitting at a worryingly high 21.1%, this year Give & Gain Day has a focus on supporting young people. Give & Gain Day volunteers are in good company, joining a global movement of thousands of volunteers across 25 countries as diverse as Spain, Iran, Nigeria and Switzerland. Sponsored by Lloyds Banking Group and Society and in association with BT, Give & Gain Day 2013 is dedicated to getting thousands of employees out of the office, store or factory to volunteer in their local communities. By making volunteering fun, accessible and inspirational BITC believes that it is something all businesses should give their staff an opportunity to do in work time. Cast your mind back to the Virgin London Marathon coverage on TV. Can you hear the music? Can you see the masses of bobbing heads filing through the starts? It is a pretty impressive site on TV and even more so if you actually go and line the route to cheer on the runners. On the 21st April I was lucky enough to be volunteering at the point that is the highlight for everyone that completes a marathon – the finish. As part of the team that collects the timing chips and presents the runners with their medals, we experience marathon emotion at its most acute. Hanging medals brings you very close and personal to the elated, sweaty, tearful faces. We were putting medals round necks at a rate of 240 per minute at the busiest time and in total, the London Marathon counted 34,256 runners through the finish. The day before another running phenomenon in the UK did not make the headlines and was not on TV. It had 34,881 finishers*. These runners had run 5k not 26.2 miles. The finish line was actually 196 different finish lines all over the UK. But never-the-less more runners completed a parkrun on Saturday 20th April than completed the London Marathon on Sunday the 21st. I am enormously proud to be part of the parkrun movement that is sweeping the country and empowering volunteers to set up timed 5k runs for their local community (see “The Volunteering phenomenon of the decade”). These events are non-elitist, friendly and informal. And they are bringing communities together. 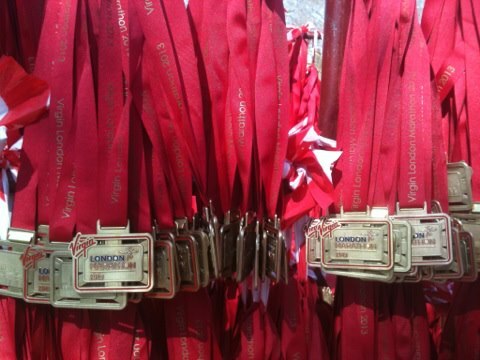 On the weekend of 20-21st April 2013, two events took place in the UK that involved similar numbers of runners. One of them was the Virgin London Marathon. But if you know someone who might like a friendly, local 5k to start with, tell them about parkrun! Now we have deflated the finish gantry on the 7th, and my final, Clandon Park Run, I would like to say thank you to the 100 volunteers who have helped on the day – every year. When they agreed to help 7 years ago, many had no idea what was in store and I’m sure this is the only time they put on a high-viz, stand in a field and cheer. I would like to pay tribute to their loyalty. The Clandon Park Run is like any other charity run. It attracts serious and fun runners and it relies on a lot of volunteers to hand out race numbers and marshal runners round the course. Compared to many charity runs Clandon needs a generous number of volunteers to look after the hundreds of under-18s that take part. What started as a school fundraiser has gained a life of its own as a community event and I think this is what has made it so popular. Every year we are reminded that the local and school communities want to be involved either to run or to volunteer and some volunteers keep coming back long after their children have left the school. Thank you to all our volunteers – it has been a pleasure to work with you. In the first couple of years we held briefings. We give everyone a drink and some cake! I’ve just been invited for an interview for the Commonwealth Games being held in Glasgow next year. And when that message landed in my inbox I felt a buzz. I am one of the 50,000 who had applied to volunteer at Glasgow2014 (and I’ve been an Olympic Games Maker so I know the routine) and yet I was surprised and really very excited by an e-mail called “Interview Invitation”. As a Volunteer Manager, I’m more used to being the person who does the inviting. And when we contact our would-be volunteers, even though we are approaching registered volunteers – and not cold-calling random people – it is easy to think that we are intruding on their time. Why are we so hesitant to ask for help? What makes us reluctant to make a request? After all, we are taking up an offer they have previously made. Volunteer Managers – be bold; be confident; be positive! Remember we are making the contact that our volunteers have been waiting for. We cannot guess what motivated them to offer: we shouldn’t make assumptions about their response. We should speak to every volunteer as if we are giving them the exciting news they have been looking forward to. There are 15,000 places for the 50,000 applicants. Will I make it through? Watch this space! parkrun is a growing movement that organises 5k timed runs for thousands of people every week. I first talked about it in my blog post The volunteering phenomenon of the decade. Since then the numbers have grown, and currently 253,000 people take part in parkruns at 170 locations around the UK. If you are not familiar with parkrun, this is how it works: Each event will have a Run Director who leads a team of helpers, and these helpers can be runners or local community members. Runners can help as much or as little as they like; there is no obligation to help. Results are published and there are tables of fastest times and numbers of runs. parkrunning is addictive and competitive – not in terms of medals or places as it is not a race – but in terms of how many you have completed. There is a small but growing band of stalwarts who get to wear “250” t-shirts. Some events find it easy to get enough volunteers, others find it harder. Apparently only around 10% of active parkrunners volunteer. Anyone that wants to run just needs to register for parkrun and can turn up and run every week for free. There has been a debate recently about the right level of recognition and reward for volunteers. Should volunteers get more recognition? Should volunteers not get any reward at all? Should all parkrunners be made to take a turn? Anyone who reads this blog will know that I believe that volunteering is not at all about “doing good” but instead it’s all about “making things you believe in happen” and enjoying yourself while you do. I think volunteers need to get something for themselves out of what they do. But this something is not a material reward. It is usually satisfaction, camaraderie, or a sense of community. If you are volunteering out of obligation then you won’t do it with good grace, you probably wont enjoy it and you certainly won’t keep doing it. But despite all this, I had started to think of parkrun as more of a cooperative – that everyone who took part was obliged to take their turn organising, rather than truly volunteering. As a runner, and a Run Director, I had even started to fall into the mindset of feeling that I was “sacrificing my runs in order to volunteer”. Whatever happened to altruism? I’m pleased to say that Tom has helped me to find it again. I enjoy my runs, but on my Run Director days I am happy to get cold fingers and toes and a warm feeling inside. How do you manage a mix of volunteers? It’s a World Champs, we’ll need 100s of volunteers, and it’s 500 miles away…. This is my volunteering philosophy, do you agree?